Hello everyone, happy hump day, otherwise known as middle of the week, otherwise known as What I Ate Wednesdays! Woop! One of my favorite days of the week in the blog world, this awesome linky party hosted by Jen is so overwhelmingly popular it’s spectacular how many people are out there willing to share their daily eats and sips as well as their fitness adventures. Today I received THREE packages! I woke up today unsure if I was going to take a rest day today or Tuesday. I normally schedule my rest days (since I work out in the mornings) on Tuesdays and Thursdays, which are my internship days so that I can sleep in a bit longer but since I’ve been working out twice a day the past few days I’ve decided today is a better day for a rest day. I have been very motivated lately and it’s been awesome. I have been doing my regular Curvalicious morning weight training workouts but in addition to that I have been also going to the gym to do some light cardio in the evenings while reading a book or listening to music or just to do some free-flow yoga. I have been really counting on my FitBit to tell me how much I’ve been moving and making sure I get in at least 10,000 steps a day. I sit most of the day so an additional slow cardio in the evenings seems like the perfect way to get up to that 10k. I woke up pretty tired though and I want to avoid overtraining so I took today off instead of Tuesday. I am going to do a higher intensity cardio later in the evening though. Breakfast: I haven’t had my regular eggs for breakfast and since I wasn’t working out this morning I felt it was a good choice. 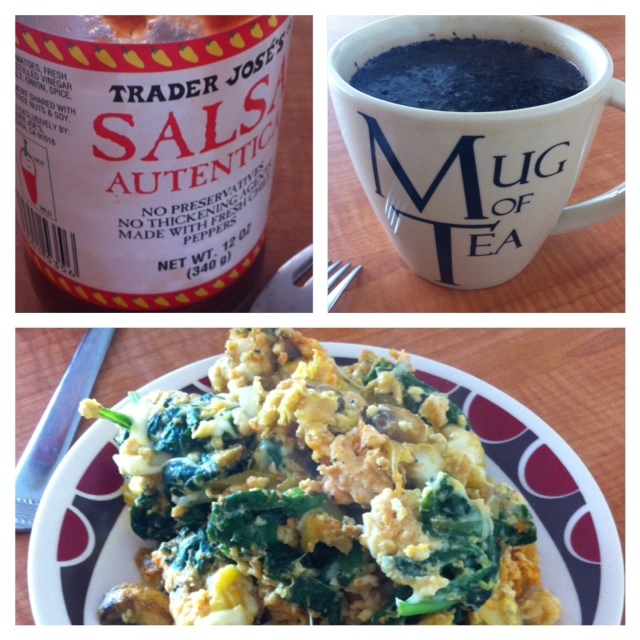 Eggs with onions, mushrooms, and spinach topped with Salsa and Rooibos tea on the side. Lunch: I hung out with my mom today and we went to a few stores and ended our day date at this Mediterranean joint next door to her salon. She has been raving about how good it is and so naturally I felt it was the perfect pick for our lunch. The inside of the restaurant isn’t special, it’s a small diner looking place, very authentic and the menu had simple names in English and Palestinian written out, without any descriptions. The food is cheap but she said everything she’s had so far was delicious. First we were given lentil soup that was apparently included with the meal purchase. 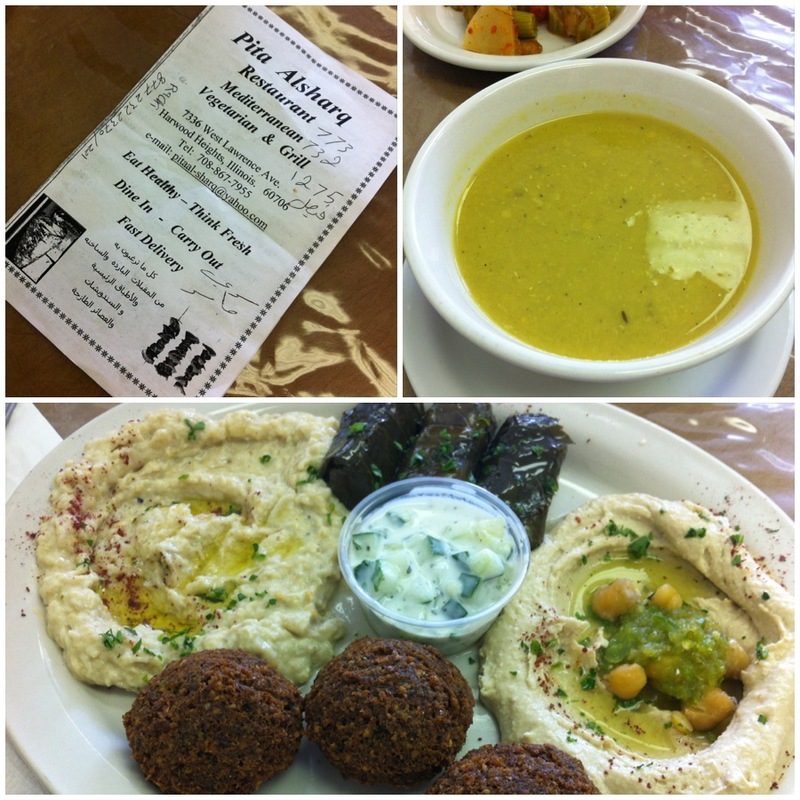 The lentil soup was good and creamy. We also got these vinegar veggies on the side (pictured below) but they were way too salty and vinegar-y for me. We also asked not to bring us any bread or rice – we didn’t want to stuff ourselves with unnecessary calories before our main meal. For the actual meal, I decided to get a Vegetarian Combo which consisted of baba ganouj, grape leaves, falafel, hummus, and cucumber yogurt sauce. Everything was delicious and fresh! 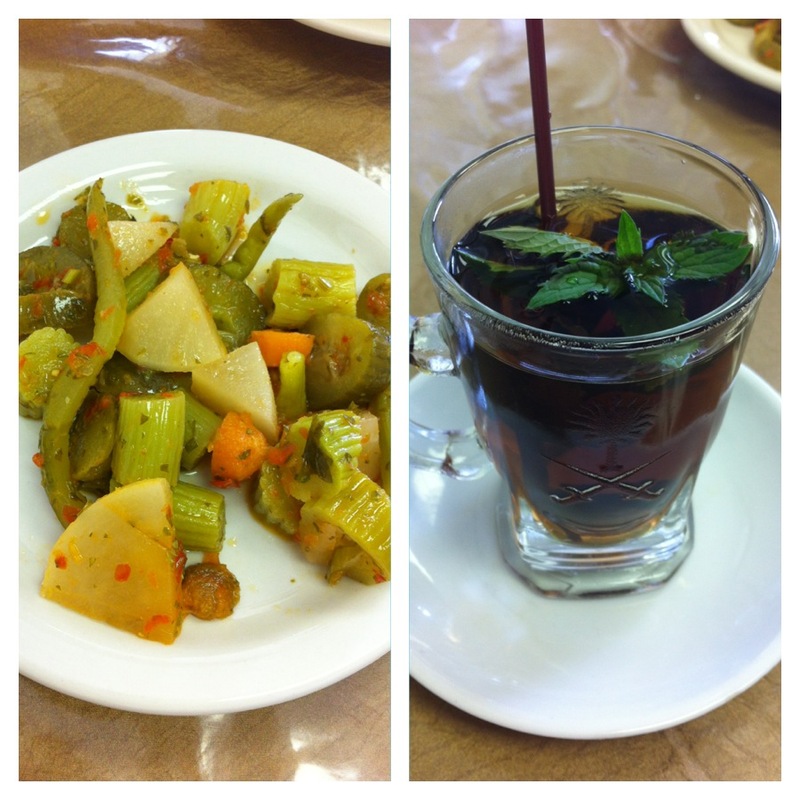 On the left is the uber vinegary veggies we got pre-meal and on the right is tea with mint that we got after we were done with our meal. How awesome is that? For $9 I got soup, veggie meal, and tea! I was very pleasantly surprised and left the diner feeling happy and full. 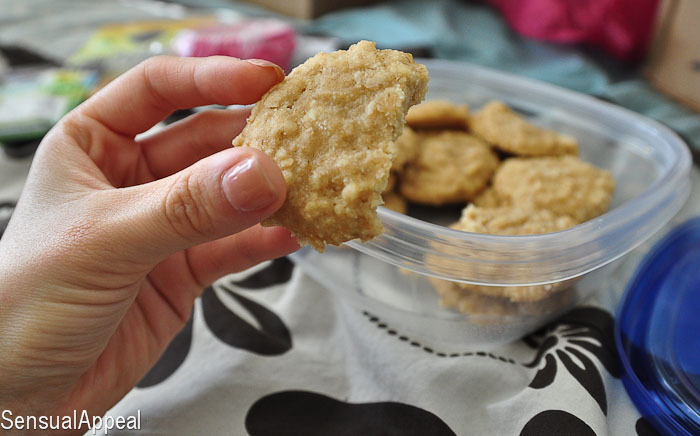 Oh my gosh… I melted, these are so good! Happy WIAW! Your lunch looks tasty! Thanks for sharing. Your breakfast looks delicious! I wish eggs would appeal to me for breakfast but I’d just rather have oats, yoghurt, etc. The only time I have eggs in the morning is when there’s a breakfast buffet at hotels or for very special occasions. Have a great WIAW!!! 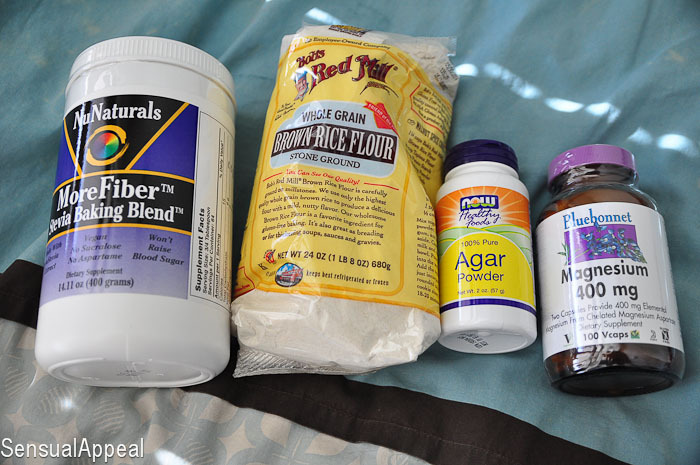 I love getting food packages in the mail too! I participated in foodie pen pals this month too (along with a vegan food swap)! I love your purchases from Sur La Tab..such a lovely store…is that le Creuset stuff you got? Sur La Table rocks! And I have no idea if that’s le Creuset actually haha! I don’t think so though cause it was pretty inexpensive. Yay for packages, they are just the best and you received such great stuff! I have dinners like that sometimes… two parts to it and usually helps to satisfy whatever cravings I am having! I seem to have those a lot haha but I can’t help it. It’s especially easy when you live alone too, don’t have anyone else to feed but yourself. 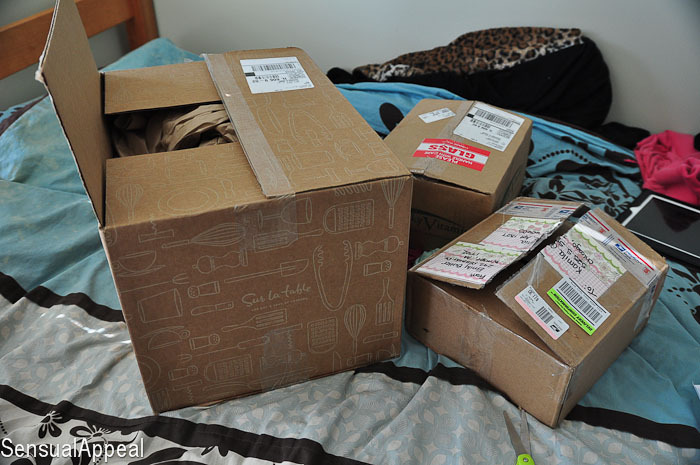 oh i wished 3 big foodie packages would wait for me at home too!! wanna be my foodie penpal too? 😉 good for u that u r so motivated with ur workouts! yay!! well i tried but i live in austria and foodie penpal is only open for people from the us and canada! such a shame! i would love to take part! I know, I’ve been trying very hard not to cross the line – it’s really easy to and I’ve done it before so I have to constantly remind myself not to get obsessed. I’ll post the winners tomorrow 🙂 Stay tuned! Don’t you just love getting surprise packages? Everything you ate looks delish!! Your lunch looked mighty tasty! All of the best thing on one plate. Love me some mediterranean! Love all the packages! I always get so excited when I get something in the mail! I used to call ups the prize truck when I was younger lol! Yumm that Mediterranean food looks awesome!! I just might have to make those cookies.. they look sooo good! Oh your egg dish looks delish, I always make my omelets with spinach and mushrooms, I need to start trying new combos! thanks for the mention! 3 packages, that’s awesome! Everything looks great. I can never have enough baba ghannouj! wait what is that on the top of your apple pie parfait? is that actual apple pie? or applesauce? I’ve always wanted to try an authentic Mediterranean restaurant. : ) The food looks really good. I giggled when you mentioned your “recycled” picture. I do that sometimes on my blog, though I try to use photoshop to get a different angle so it isn’t obvious!